Running Windows 10 and Linux on the same computer is easier than ever. Here’s how to do it. A computer that boots both Windows 10 and Linux can easily be the best of both worlds. Having easy access to either of the operating systems lets you enjoy the benefits of both. You can hone your Linux skills and enjoy the free software only available for Linux platforms. Or, you can switch back to Windows 10 to use apps like Photoshop, AutoCAD or Microsoft Office. The beauty of dual booting is that it lets each operating system take full advantage of the hardware resources of your computer. 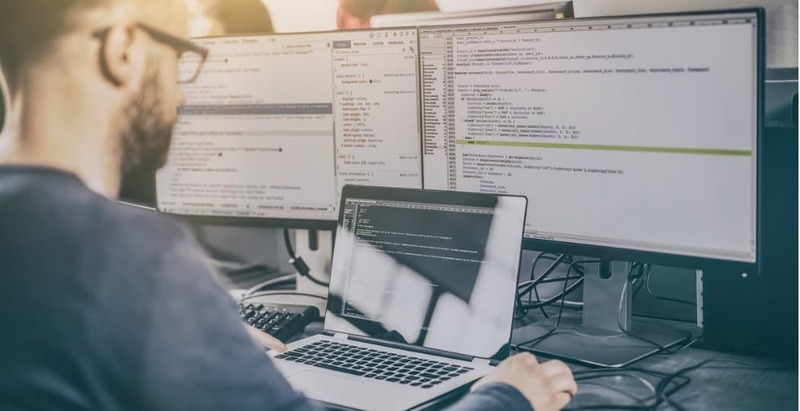 While virtual machines and the Windows Subsystem for Linux can give you a taste of the Linux experience, dual booting lets you tap its full potential. The good news is that Windows 10 and Linux live in harmony better than ever these days. Dual booting Windows 10 and Linux used to be a precarious process that could wreck your Windows installation, your Linux installation or both. While the process isn’t quite a smooth as dual booting macOS and Windows with Boot Camp, it comes close. In this article, we’ll show you how to safely install Windows 10 and Linux on the same hard drive. It doesn’t matter if you’re starting with Linux or starting with Windows—dual booting is easy to set up either way. Let’s start with the (slightly) harder way first; you already have a copy Linux installed and you want to install Windows on a partition. 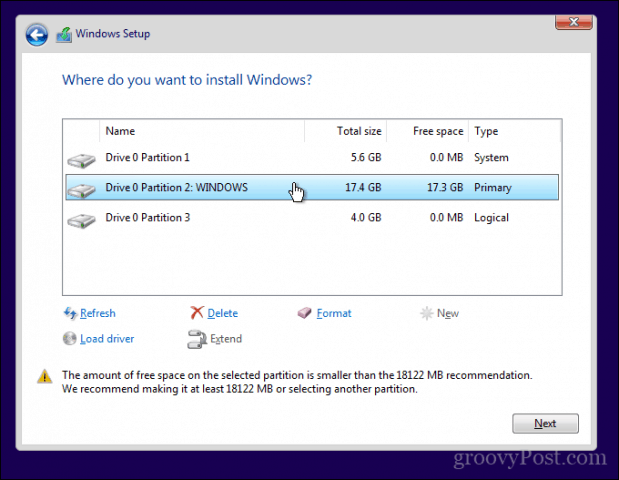 The first step is to create the partition where Windows 10 will be installed. We have covered how to create partitions in Linux, so, start by reviewing our article on how to do that. Once you have your partition set up, you will need to purchase Windows 10, download the ISO file then create a bootable copy. Creating a bootable copy of Windows 10 on Linux can be done using the free Unetbootin (USB thumb drive) or Brasero software if you are installing from a DVD. 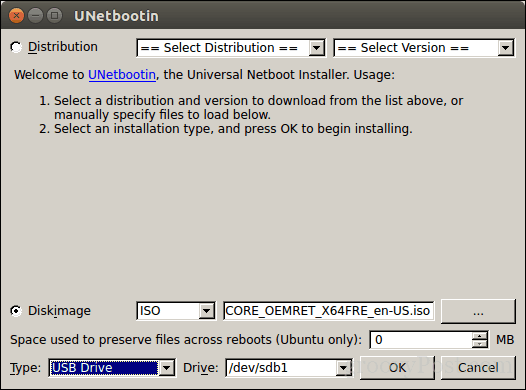 Unetbootin can be downloaded from the Software Center in Ubuntu. Once you have it up and running, launch it. Make sure you are using a thumb drive with at least 8 GBs of free space. Select the Disk Image radio box, click the browse button (represented by an ellipsis …), browse to the ISO file then click Open. Chose the medium from the Type list box—in this case, your USB drive. Click on the drive list box then select your USB thumb drive. Note: If you are not offered the option to select your thumb drive, you need to format it using the FAT32 file system. Open the file manager, right-click the thumb drive then click Format. Click OK, then wait while the bootable copy is created. 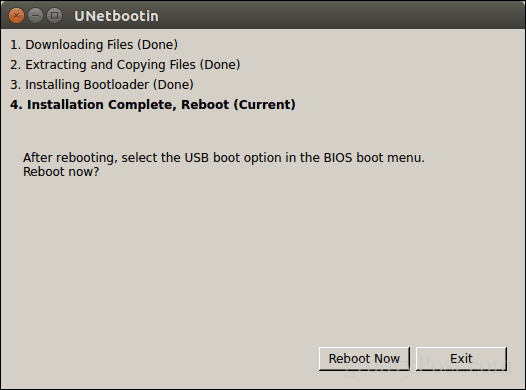 If you already made a bootable USB with Unetbootin, you can skip this part. If you are still using an old school system with a DVD drive, you can use the Brasero DVD Burning software, which you can download from the Software Center also. Please keep in mind, Windows 10 ISO files are getting larger beyond the standard 4.7 GB DVDs. So, in some cases, it’s best you use 8.5 GB dual-layer DVDs if supported by your drive. If you can’t, then it’s best you use a USB thumb drive. In Brasero, click Burn Image. 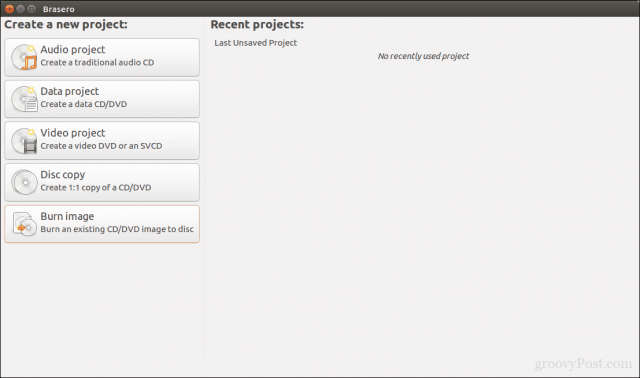 Select your disc image, make sure a blank DVD disc is inserted then click Burn. After preparing your install media, insert it or connect it. Reboot your computer, then configure your BIOS to boot from the drive. Windows 10 will boot into setup as it normally does. After you arrive at the setup screen, click Custom: Install Windows only (advanced). Make sure you select the right partition; don’t wipe out your Linux installation. Click Next then wait while Windows 10 Setup copies files to the drive. Your computer will be rebooted several times. When setup is complete, follow the instructions to complete the out of box experience. After that’s complete, you might notice the obvious—there is no way to boot into Linux anymore. Here is how you fix that. 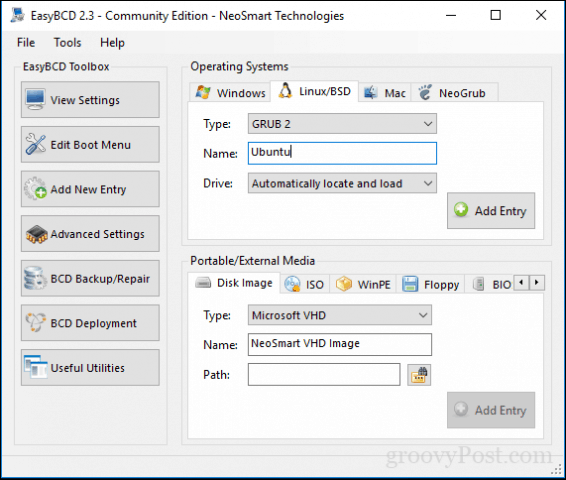 Download a free utility called EasyBCD from Neosmart Technologies. Proceed to install EasyBCD then launch it. Select the Linux/BSD tab. 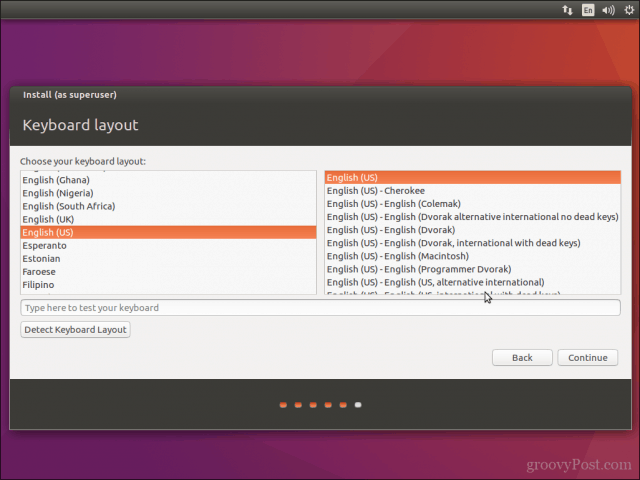 Click in the type list box, select Ubuntu; enter the name of the Linux distribution, choose automatically locate and load then click Add Entry. Reboot your computer. You will now see a boot entry for Linux on the Windows graphical boot manager. For many users, Windows 10 installed first will be the likely configuration. In fact, this is the ideal way to dual boot Windows and Linux. 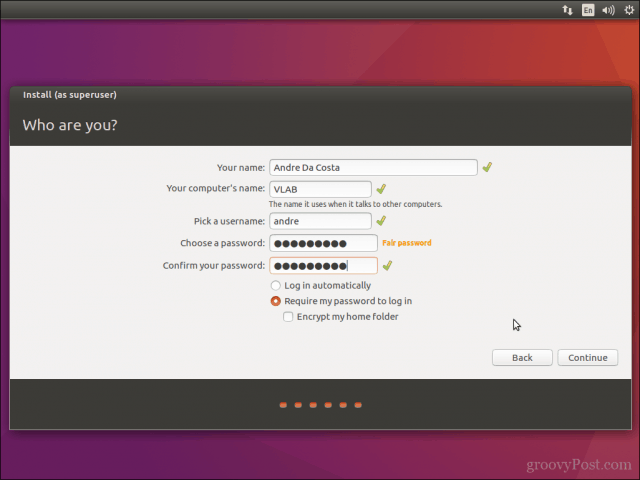 Again, I will be using the Ubuntu Linux distribution. 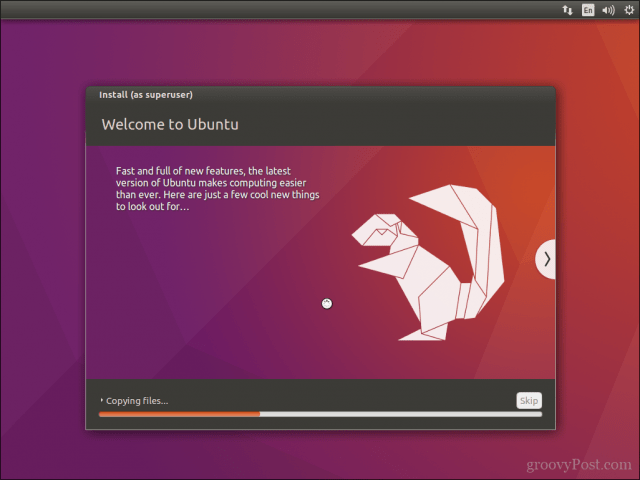 You can download the Ubuntu Linux ISO image from Canonical’s web page then create a bootable copy using Unetbootin for Windows or burn to a blank DVD using disc image in Windows 10. After creating your install media, configure your BIOS to boot from it. 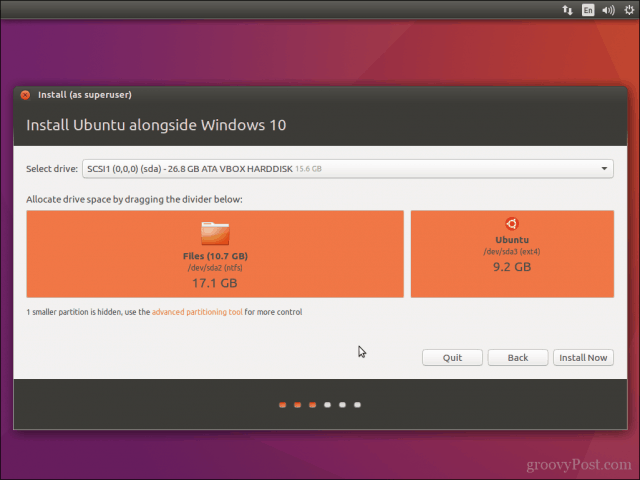 Ubuntu’s installation wizard intelligently detects existing Windows installations. 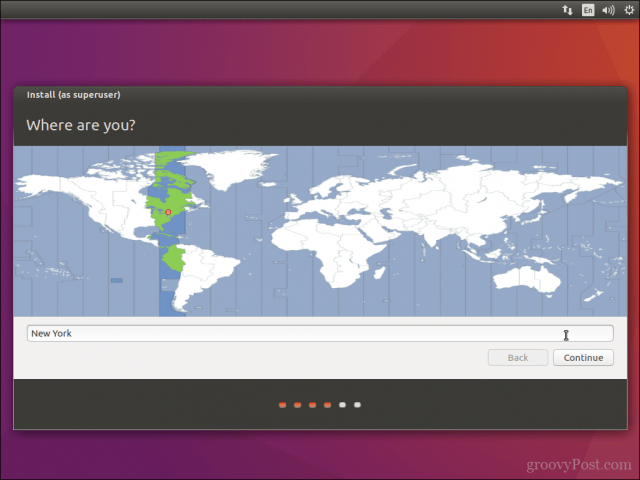 It will ask you if you would like to install Ubuntu alongside Windows. At the Ubuntu install screen, click Install Ubuntu. 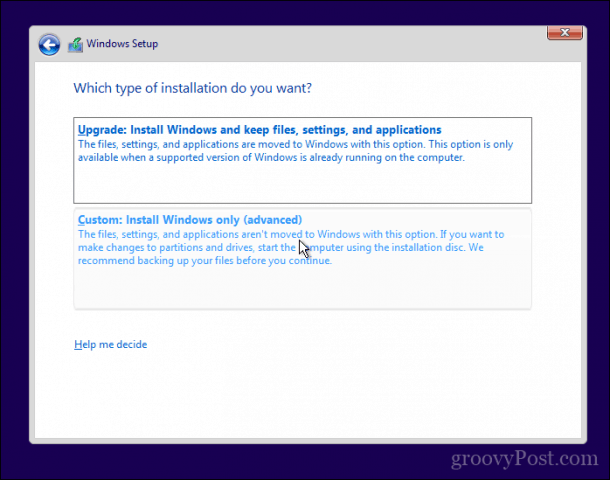 Choose whether you want to download and install updates and third-party drivers and codecs then click Continue. 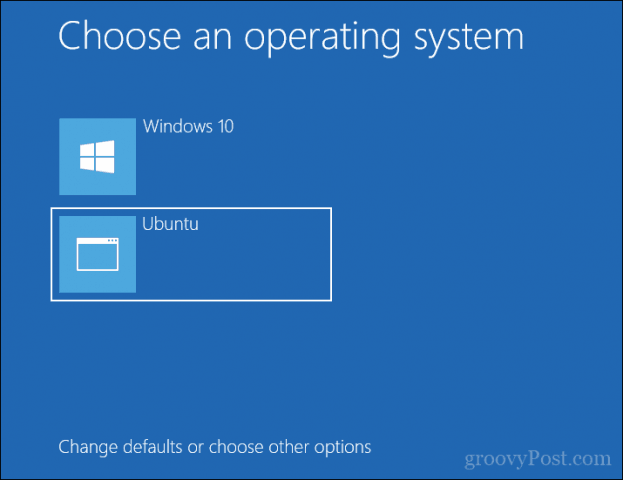 Select the option Install Ubuntu alongside Windows 10 then click Continue. 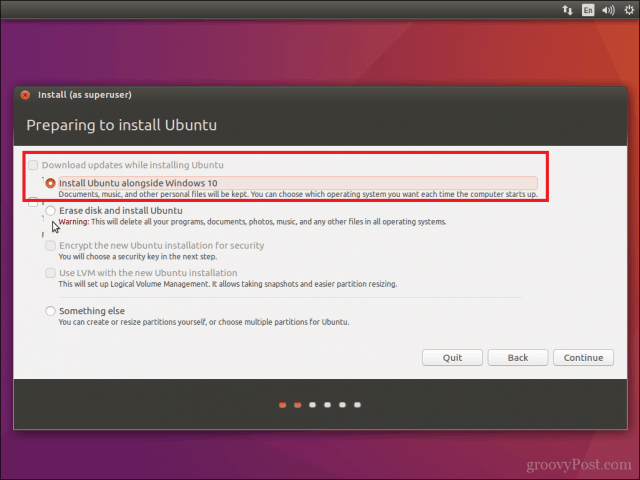 Ubuntu’s installer will set a default allocation of space for the installation. If you have enough space, you can resize the partition by placing your mouse between the divider then drag it left or right to make adjustments. 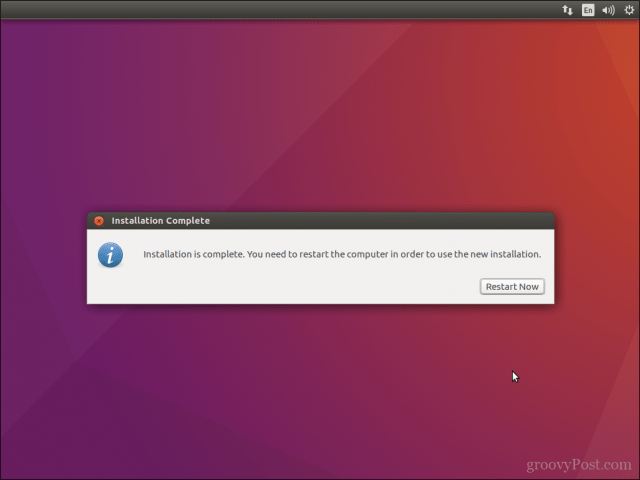 Once you are satisfied with the allocated amount for your Ubuntu installation, click Install Now. Click Continue to confirm changes. Enter your time zone then click Continue. Select your keyboard layout, click Continue. Create your user account by providing your full name, computer name, login name, and password. Choose whether you want to log in automatically or be prompted for a password. You can also encrypt your home folder for extra security. Click Continue. Wait while Ubuntu copies files. When complete, click Restart Now. Ubuntu will add a boot entry for Windows 10 to the GRUB boot manager, which you can select using the up or down arrow then hitting Enter. That’s it, Windows 10 and Ubuntu is now set up on your computer. Let us know what you think. If you have done this before, share some of your tips with us. By the way, what’s your favorite distro? How to set Windows as default OS at startup? Good luck, but that’s too much for me! Last time I tried this, nobody seemed to know how to set Windows as the default OS. Has this been solved? You can use EasyBCD to change the boot order. Whatever happened to “Startup Manager” once available from Ubuntu? It was _really_ easy to use, being fully graphical. Thanks for all the advice and feedback. I have been using Linux since 2006. Before UEFI booting the dual-booting setup was fairly straight forward for ANY Linux distro.. Not so much anymore. The information in this article works well because Ubuntu and some of its spin-off distros like Mint work with UEFI booting. Sadly many other Linux distros do not and turning off UEFI boot can create havoc and render some systems unable to boot at all ( I have gone through this 3 times already) and a lot of work to get back. It would have been nice if you pointed this out here so the average user didn’t go find a different distro they like better and start a process that would render a nightmare of problems. Otherwise, as I said a very useful and informative article. Thanks for your feedback. For the average user who wants to something well known and established, they are likely to choose one of the prominent distros. The Windows 10 Subsystem for Linux supports all the major distro’s: Ubuntu, Fedora, SUSE and as your noted, Linux Mint which based on Ubuntu would be supported. If you are going choose lesser known and supported distro’s that are not as mainstream like a Arch or even a CentOS then I would say you are selectively choosing a challenging path. Nothing wrong with that, but for someone who just wants a easy to use distro that provides all the rich facilities, as I even described in the article, Ubuntu Linux would be more of a guidance. The article title might of course sway some to think its easy breezy with every distro, but I have to be realistic, they are hundreds of distros and I could never cover everyone. But I do thank you for the clarifications. well, i’d rather say that dual boot from the winXP days was easier than from win8 up, because winXP was not that smart (less system features). you will notice, that after dual boot install, windows shows wrong time on the clock. the reason is a different time format. windows uses local time, while unix based OSes use universal time (UTC). if you, like me, use an extra partition/HDD in NTFS format as a data partition for both OSes, you’ll get in trouble in linux. After instaling Ubuntu 16.04 besides Windows 10 and reboot, no grub menu appears. Ubuntu is ignored and Windows starts up non stop. Windows 10 already installed, when I run the Ubuntu install I do not get “Select the option Install Ubuntu alongside Windows 10 then click Continue.” as an Option. I’ve had that happen to me. 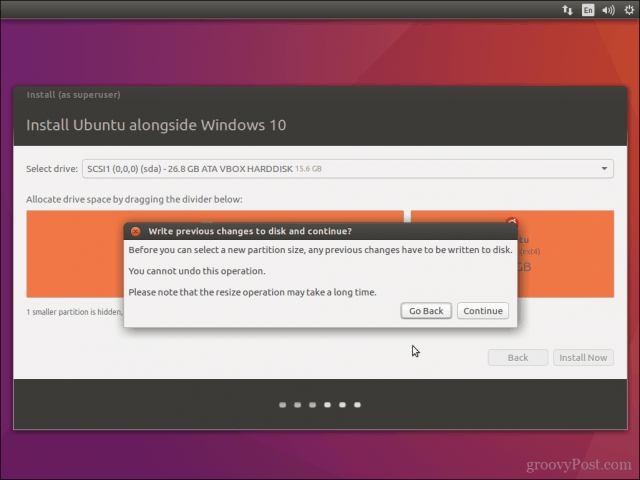 You probably do not have a remaining primary partition for Ubuntu. 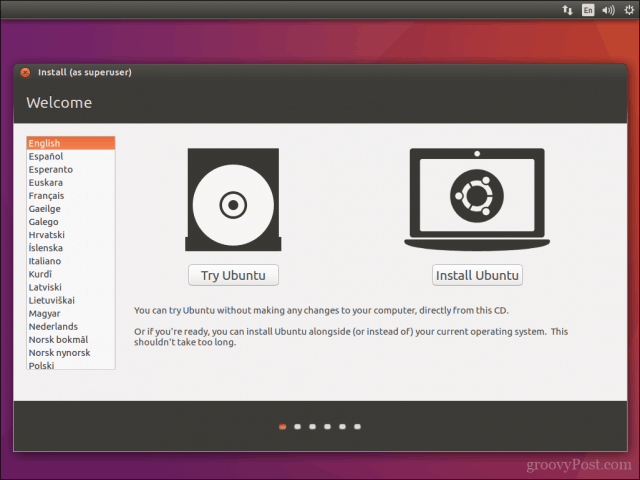 That’s fine, you can still do a custom install for Ubuntu. Thank you for your article, after installing Ubuntu alongside Windows 10, in want access the Ubuntu or Windows 10 via the Blue GUI screen. Can I use “EasyBCD from Neosmart Technologies” to do that? If yes should fire it from Windows or Ubuntu? I am planning to install Linux Mint along with Win 10. What i need is that while booting, if i press a particular key, only then i should get the dual boot menu, else my system should boot directly into Win 10. Any help on this would be great. Please help.